Is their a Lisker or Berger Rebbe in NY? There are two brothers Friedlaner sons of R’ chaim in Borogh Park Brooklyn, one is the Liske Rebbe and the other one is the Hibinv Rebbe who is also the Chaplain in Maimonidies Medical Center. Miller, sorry, but their fathers name was R’ Yoizfa. R’ Yoizfe was a brother of R chaim? 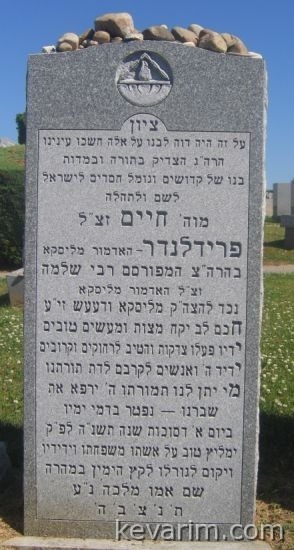 Rebbe Yoizfa, who is buried in EY was this Lisker Rebbe?s uncle. He also had a brother Rebbe Shloma the Budapester Lisker Rebbe whose kever is posted on this website. R’ Yoizfe was the father of the current Lisker Rebbe and Hibner Rav of Boro Park. I believe this is kever of the current Lisker Rebbe’s uncle, Rebbe Chaim Friedlander. He lived in Kew Gardens, Queens.